Since 2014, the new Lindcove Research and Extension Center pathology laboratory has provided the infrastructure for six College of the Sequoias (COS) undergraduate interns enrolled in the SURGE (Science Undergraduate Research Group Experience) program. In 2017, Lizbeth Garcia and Hyo Jin Kim, completed a research project at LREC under the combined mentorship of Elizabeth Fichtner, PhD., UCCE Farm Advisor, and Alfonso Lago, DVM, PhD, President, DairyExperts. Garcia and Kim's research project involved field and laboratory activities focused on a disease affecting a portion of Tulare County's 65,000+ acre pistachio industry. Narges Mahvelati, Jr. 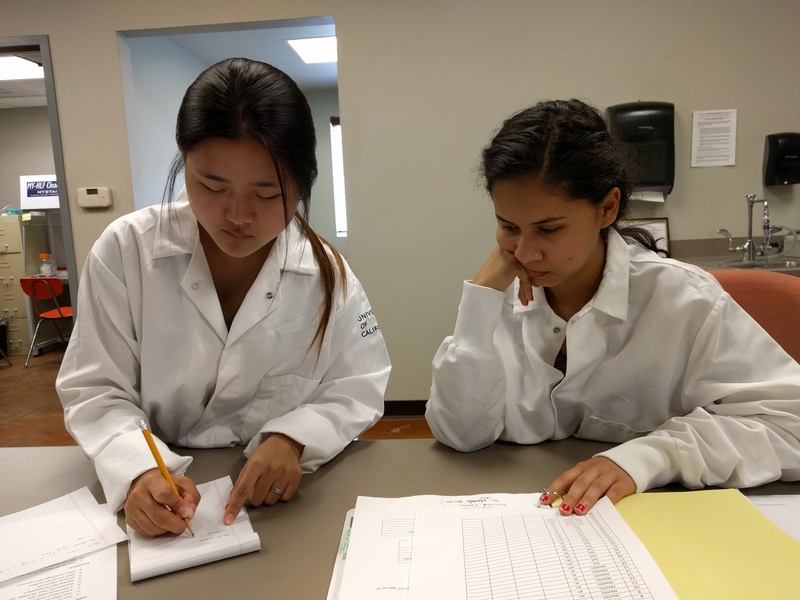 Specialist, UC Davis and Pallavi Nahata, Research Associate, DairyExperts, led students on field sampling and molecular biology work, respectively. The main emphasis of the students' project was to improve laboratory techniques for the diagnosis of plant pathogenic bacteria. Students utilized quantitative Real Time PCR to assess the extraction efficiency of two commercial DNA kits. Support for the molecular work at LREC was provided by Therese Kapaun, LREC Staff Research Associate. Both Kim and Garcia started their undergraduate programs at COS and plan to complete their BSs in the UC and CSU systems. Kim is transferring to UCLA in September and is interested in a career in clinical laboratory research. Garcia intends to transfer to CSU Fullerton in 2018. In completion of their internship, Kim and Garcia presented a poster presentation of their results at the SURGE Symposium at COS on 8/11/2017. 1. 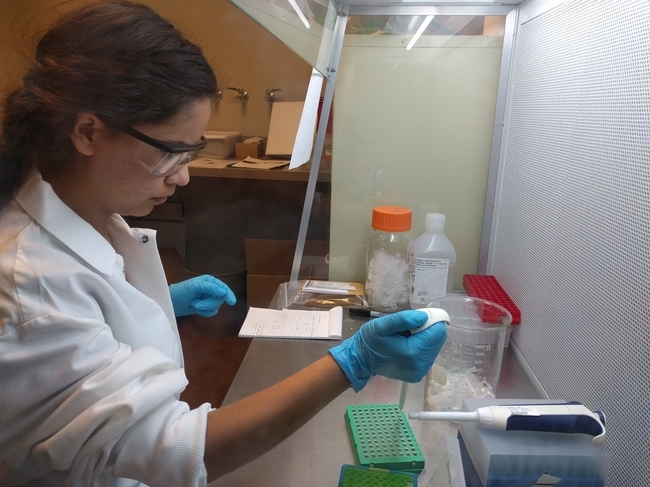 Hyo Jin Kim, sets up well plate for PCR. 2. Hyo Jin Kim and LizBeth Garcia, interpret quantitative PCR output.